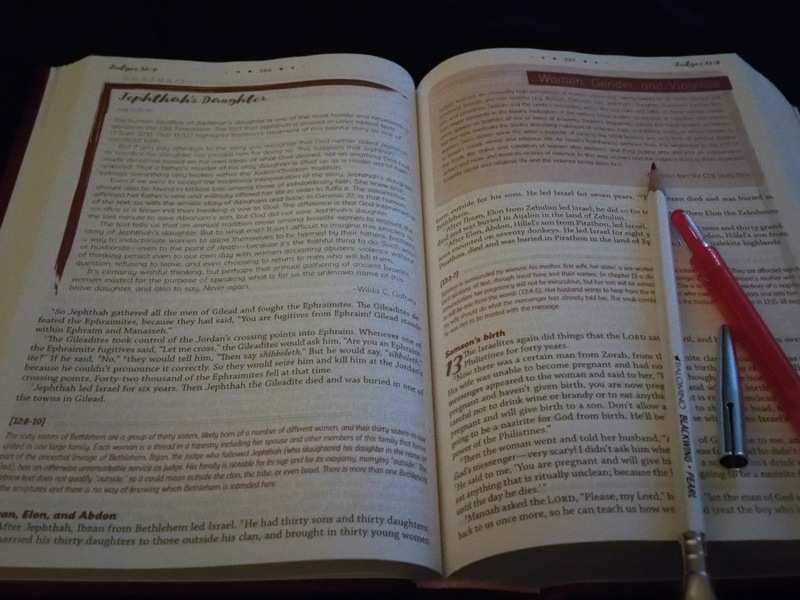 I don’t typically review books here on my blog, but a few weeks ago I was given the opportunity to receive a copy of The CEB Women’s Bible in exchange for an unbiased review. Since I only have about 30 bound editions of the Bible, and more digital editions than I’ve actually counted I obviously needed one more, and so I eagerly jumped on this opportunity.Reviewing The Bible is frankly, a little intimidating. It’s not like I’m going to take issue with the author’s use of a literary device, or give a “thumbs-up” for an unexpected plot twist. Instead, I’m simply evaluating and giving an opinion on how well this translation and supporting material handles the sacred text of Scripture. The Contemporary English Bible (CEB) translation; completed in 2011 by a group of 150 male and female translators from a broad cross-section of Christian faith traditions, certainly provides an accessible and inclusive English translation that resides firmly and reliably in the contemporary language space. That, however, is not what I appreciate most about this Bible. I already had both print and digital editions of the CEB, and I didn’t expect to be particularly impressed by what I assumed would be the addition of a floral cover and a decorative font. With 80 editors and contributors to this edition; every one of them a woman, The CEB Women’s Bible is more than just a prettier Bible, and these editors and contributors surprised me with the thoroughness and thoughtfulness of the supporting material that has been added. Each Book is prefaced with an Introduction, providing historical and cultural context, and every chapter has at least one Reflection, drawing more focused attention to a particular theme or topic. Scattered throughout the text are over 200 Sidebars. These are brief, topical articles that encourage the reader toward a practical and current application of scripture in their own life. The choice to encapsulate the Sidebar material within a pink text box is an outdated and somewhat tired feminization treatment that could have been given more creative effort, but that doesn’t diminish the content. I did appreciate both the alphabetical and canonical Index of all Sidebar Articles. The main extra that sets this Bible apart is the inclusion of another Index of every named and unnamed woman in the Bible with 100 character sketches (Portraits,) providing additional context and commentary on these women and their place within the Story of God. There are also 16, full color, gridded Maps with accompanying legends to facilitate the plotting of over 1,000 named locations. Although the nerd in me is kind of impressed by the detail here, realistically I might reference it a dozen times over the course of a year, so not a feature that would entice me to purchase this edition. But, the back of the Bible also contains a section of Discussion and Reflection Questions organized around the Scripture readings from the Revised Common Lectionary for the entire 3-year (A,B,C) cycle, and I am in love with this feature! I am so looking forward to utilizing this tool with a Small Group or Spiritual Development class in the coming year. I am also a strong advocate for an intentional Bible reading plan so I was glad to see the inclusion of three different reading plans; One Month Bible Overview Plan, New Testament in 90 Days Plan, and Bible in One Year Plan. With regard to the book specs; the edition I received for review was a printed hardcover with no jacket, and laid flat from anywhere in the book. The paper is light weight, smooth white. It allowed noticeable ghosting when I used my Sharpie ultra fine tip markers, but very little with colored pencils. The text is a standard-sized serif font with narrow margins. The single column format does help with ease of reading, and there is white space at the end of most books to allow for limited note-taking. I wasn’t expecting to enjoy this edition as much as I have. There are some important and useful elements to this Bible that highlight and affirm the position of women as equal bearers of the image of God, and I genuinely appreciate having the name and position of every editor and contributor listed, with attribution also given alongside each Introduction, Sidebar, Reflection, and Portrait. It gives wonderful contrast to the generations of women who have remained invisible and nameless in carrying forth the message and mission of God. Let me know if you’re planning to purchase a copy of The CEB Women’s Bible and would like to join in an online study group working from the Discussion & Reflection Questions!